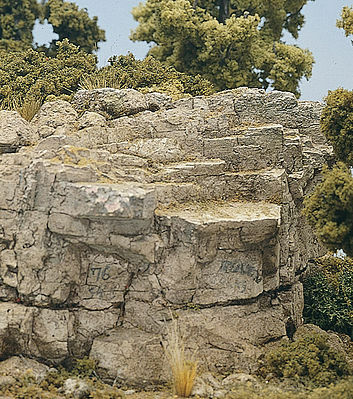 This You Can Do It Learning Kit is the Economical Way in Learning How to Create Realistic Rock Faces for Any Scale from Woodland Scenics. Retail $16.99 SAVE 24% ! I am looking forward to working with this product. From what video I have seen, using this kit the possibilities are only limited to my imagination. I believe this kit should elevate my scenery to a professional level. Learning Kits are value-packed tools that help beginning model railroaders learn how to use Woodland Scenics' scenery system. Rock Faces Learning Kit teaches modelers to make and color realistic rock formations. Get started on casting, coloring, and mounting rock faces. -Pigments (Black, Yellow Ocher, Burnt Umber). To learn more detailed and advanced techniques, see Woodland Scenics books, videos, and other Learning Kits.